I have always been fiercely protective about my independence, even as a little toddler. And driving is one of those skills that truly makes you feel independent. 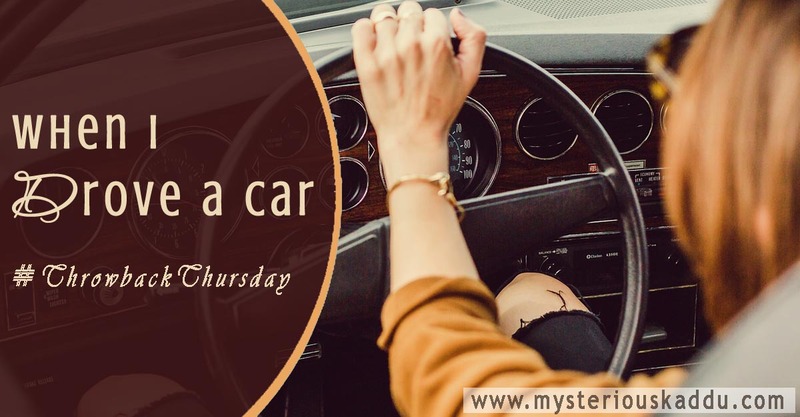 Yes, cab services in India are considerably more affordable now, but still, there are times when you wish to be able to drive your own vehicle. Unfortunately, I haven't been able to achieve this level of independence yet. Not because of lack of trying though. Today happens to be a Thursday, and I have decided to share all my personal adventures (or perhaps I should call them "mis-adventures"?) with you guys here, as #ThrowbackThursday posts. So here's the story of what happened when I tried to drive a car! When I Drove A Car: My Two Lone Driving Lessons! I had all of two driving lessons, one in an open ground (some sort of neighborhood playground, I guess) and one in mild traffic. My "instructor" was a friend of my younger sister, back in Patna. The year was probably 2005. So the lesson in the playground went off quite well (if I may say so myself). I had the car in complete control (only in first gear though, as I could never remember to change it to second gear), and was even able to make that perfect '8' in reverse! A really small '8' too! A feat that even many experienced drivers can't manage! Needless to say, my "instructor" was very impressed with me, so he decided to let me take the car out in traffic in the next lesson. Ohhhh... but my driving in traffic! It almost gave him a heart attack! You see, 'yours truly', apparently, didn't just forget to switch from first gear, but (oops!) 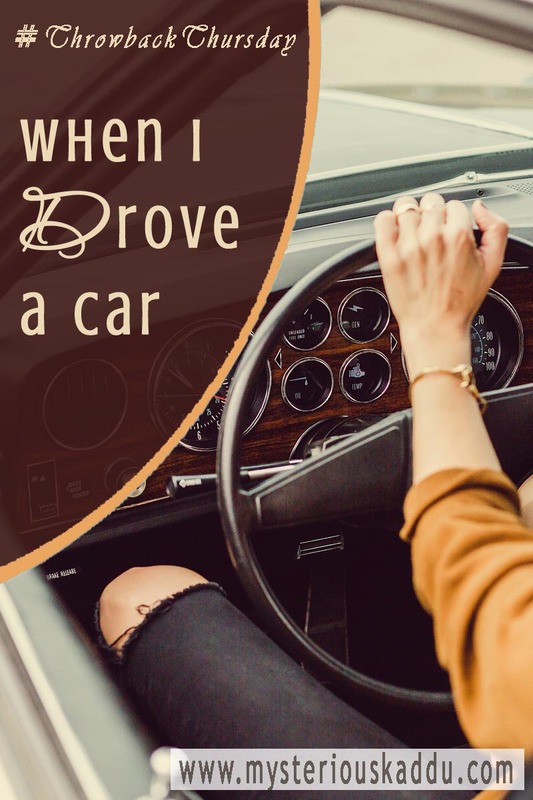 she could also not grasp the concept that there is something called "brakes" in the car, and that when someone comes in front of your car, you're supposed to USE those brakes, and not scream at them and jerk your head sideways to "shoo" them off your path! But you know what... the real culprit was actually "Road Fighter". That popular video game that I was hooked on to for years, on my old Samurai game player. If you have ever played that game, then you'll remember: The cars used to switch lanes directly in front of you, all of a sudden, causing you to swerve at the very last instant. I suppose that game left some long-term imprints in my neurological system... you know, like neural pathways or something, so that even after years, when I drove a *real* car, in *real* traffic, I still drove the same way! I kept expecting vehicles to "switch lanes" all of a sudden. (That's what they did in the game. That's what my brain was trained for.) And so I avoided changing my course till the very last instant. So, here I am. More than a decade later, but I still can't brag about being able to drive a car! Sighhhhhh! I suppose I could give it another try. I mean, surely I can remember to switch gears with practice, AND use the brakes too, yes. But I'm afraid I'd still drive the "Road Fighter" way. I happened to play that game again a couple of years ago, and you know what, those "neural pathways"... they're all still there! So yeah... that's about it. Do you have any crazy driving stories to share? This is my fourth post for A to Z 2019. Even I used to love Road fighter game. But your story is so funny that I was literally going rofl. I am.yet to learn driving only for the fear of running over people. Oh I need to learn to drive. I learnt once then because I didn't drive I forgot and now I don't even remember where the ABC were. Sigh! This was quite funny especially that bit about the brakes. But I would say that you should give it a try again. You've got company, Chicky! I don't drive either, and not for the lack of trying. Interesting story, though I will say keep trying! Your neural pathways will adapt slowly! My father and mother both taught me driving and after that I took driving lessons. I passed driving exam in my second attempt - that was big turn off😌 Now I have a DL and I enjoy driving cars and scooters as per the distance I may have to travel. So never give up! !